1. Roller raceway to take up the axial loads. 3. Ball raceway provides support for radial loads. All parts are retained together as a unit during fitting. 4. Ball diameters 25 to 70 mm, roller diameters up to 100 mm. 5. 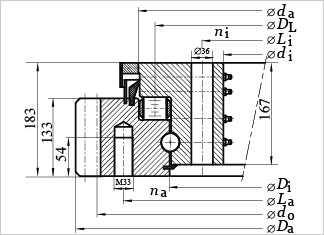 Used in application with a dominant axial force and low radial load/tilting moments. 6. Frequently produced as special designs according to customers' requirements. 7. Typical applications: Bulk materials handling, stacker reclaimers, bucket wheel excavators, machine tools.